Lie on your back with your knees bent (A). Keep your back in a neutral position, not arched and not pressed into the floor. Avoid tilting your hips. Tighten your abdominal muscles. Raise your right leg off the floor so that your knee and hip are bent at 90-degree angles. 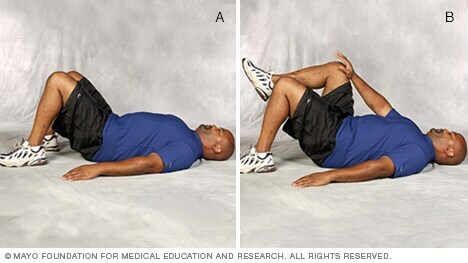 Rest your right hand on top of your right knee (B). Push your hand against your knee while using your abdominal muscles to pull your knee toward your hand. Keep your arm straight. Hold for three deep breaths. Return to the start position and repeat using your left hand and left knee.